The Mediterranean Front battles cover the attacks on Italy as well as those in the African desert. One of the best known commanders on either side would lead the Afrika Korps as time and time again it would beat the British forces all across the deserts of Africa. 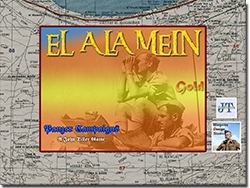 The entire war in the desert was a desperate attempt to capture the Suez Canal and all that came with it. The battles in Italy were essentially an attempt by the Allies to knock Germany's "weak sister" out of the war. Soon would come the capture of Rome and the capitulation of Italy. At that point Italy would switch sides to finish out the war. Toward the end of 1942, the German High Command saw that the tide was turning in the war. On the East Front, von Paulus was surrounded in Stalingrad. Rommel had been defeated at El Alamein in Egypt and, in October, was retreating with his battered army toward Tripoli. Now the Americans were making their presence felt by landing at various points in Morocco and Algeria, threatening the Axis position in Africa from the rear. 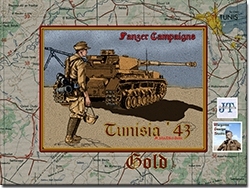 The Germans rushed forces by air and sea to Tunisia to counter the threat. They arrived just in time, as the lead elements of the allied forces made their drive to capture Tunis by Christmas 1942. Then the tide turned with the weather, the roads turned to mud tracks and the Allied drive was stalled. Wedged between the on-coming Allied Armies of Algeria and Egypt, a scratch force of powerful Germans panzers, intermixed with available infantry replacement forces, regained the initiative through February, inflicting serious losses on green US forces facing battle against a determined enemy for the first time. But this was only to delay the inevitable loss of the Axis presence in Africa. 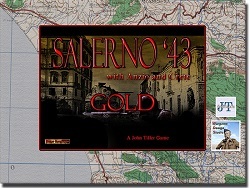 Salerno '43 - The invasion of Salerno in September 1943 and Anzio in January 1944 were two very different operations. At Salerno the US and British troops ran into a stubborn enemy determine to throw them back into the sea. So, five months later at Anzio, they acted with caution, building up their force before moving inland - but the delay allowed the Germans to pocket them into the beachhead - one that proved difficult and costly to break out of. In this Panzer Campaign title you can try your hand in command of both of these critical Allied amphibious operations that lead up to Normandy. As a bonus you can also play the German Air Assault on Crete in 1941 to round out the action in the Mediterranean. In the summer of 1942, the Afrika Korps was approaching its high-water mark. In a month-long struggle than began at Gazala, Rommel had defeated the 8th Army and driven the British back to Egypt, once again surrounding Tobruk, a prize that eluded him the previous year. Then in a surprise move, he doubled back, and captured Tobruk in a single day before turning his Panzer Army once again toward Alexandria, Cairo and the Nile. But the British would deny him the ultimate prize with a heroic stand at a lonely, unheard of railway stop known as El Alamein. By July 1943, the tides of war had turned on the Germans. Tunsia fell in May leaving no Axis territory in North Africa. On July 5th, they launched their last great offensive on the Russian Front at Kursk and were nearing their "highwater mark" when the Allies struck at the "soft underbelly" of Europe by invading Sicily. The Invading American and British forces took 38 days to capture the island due to skillful defense and fighting withdrawal in some of the most difficult terrain in the war prompting one author, Carlo D'Este to call this battle a "Bitter Victory". Can you capture the island faster? Should the Allies have opted to have Patton invade western Sicily instead of covering Monty's flank? 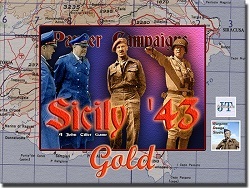 Find out with Sicily '43. Following the British defeat of the Italians in 1940, Rommel would arrive with the lead elements of the infamous Afrika Korps. 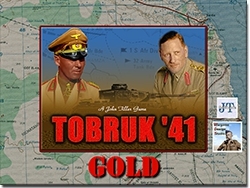 Tobruk '41 is an operational level simulation that traces the North African desert campaigns with scenarios covering action from Mersa Brega in March '41, and finishing at the end of Crusader in December. In 1940, the British had little trouble pushing the Italian army in Libya away from the Egyptian border. However early the next year, General Rommel arrived in North Africa and quickly took the offensive. While the British garrison at Tobruk held on, desperate battles were fought across the desert sands. Will the British be able to relieve Tobruk, or will Rommel earn another victory resulting in his standing as the Desert Fox?